Ahhh…summertime. Family vacations, lounging by the pool, picnics with friends, and back-to-school shopping. Whether you’re getting ready for school yourself, getting someone else ready for school, or just taking care of your own summer shopping, there are things that you can do before, during, and after your shopping trip to reduce your waste, improve our environment, and save money, too. 1. Clean out your closets and cabinets. If you are sending a student off to college, you may already have plenty of towels and sheets. If you’re sending a student back to school, you might discover unused notebooks, pens, and pencils. If you’re shopping for housewares, garden supplies, or even food, you may learn that what you need is already sitting on your shelf! 2. Organize what you already own. When you organize what you have, you’ll find things you can still use. This is also a great way to find the stuff you no longer want that you could sell or give away. 3. Plan ahead and make a list. Going to the hardware store? Make a list. Going to a clothing store? Make a list. We make fewer impulse purchases when we shop from a list. 4. Shop for reused items first. 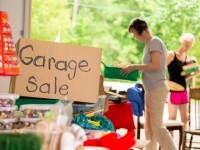 Before you hit the mall, check the neighborhood garage sales or stop by thrift stores or secondhand shops. You can find clothes, shoes, appliances, books, toys, games, office supplies, household goods, DVDs, and more. 5. Look for recycled-content products. Since it will soon be back-to-school season, paper is a great place to start. Recycled-content notebooks, loose-leaf paper, and printer paper are readily available, high-quality, and cost-competitive. And don’t forget recycled-content tissues and paper towels. These items are often on school supply lists. 6. Paper isn’t the only recycled-content product, of course! Look for pens, pencils, scissors, rulers, file folders, binders, storage containers, jewelry, and outerwear, such as fleece pullovers and scarves, to name just a few. 7. Select durable, reusable products that also reduce your waste or energy use at home. For example, if you have a drying rack, you won’t need to use your dryer as often. When you purchase electrical appliances or electronics, look for the Energy Star label, which guarantees an energy-efficient product. Choose reusables, such as refillable mugs and insulated cold cups. 8. Shop for food and flowers at farmers markets. These markets provide fresh food without extra transportation or excess packaging. National Farmers Market Week is the first week of August, so go out and show your support for our local farmers. 9. Say “no thanks” to overly packaged items. Ask yourself, “If I buy this item, how many layers of packaging are going to go straight into my recycling or trash?” If your answer is more than two, see whether an alternative product is available that has less packaging.